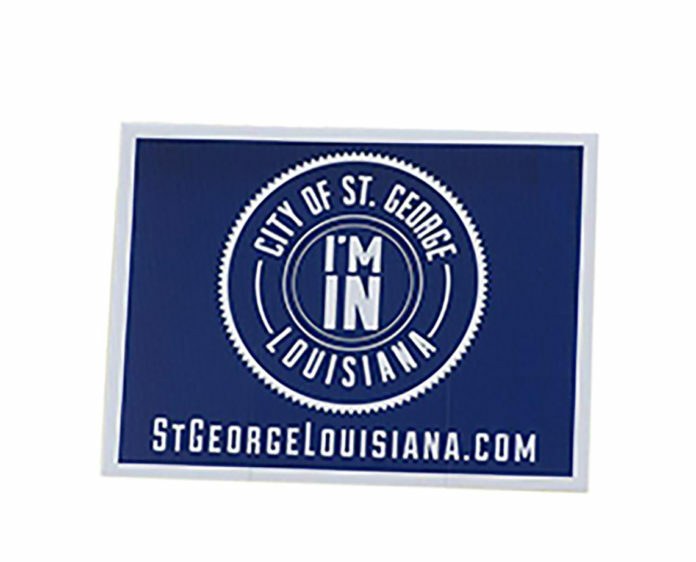 St. George petitioners have collected the necessary number of signatures to appear on a ballot, East Baton Rouge Parish Registrar of Voters Steve Raborn announced this afternoon, with some 28% of registered voters within the city’s proposed boundaries endorsing the idea. Petitioners were required to submit names of at least 25% of electors within St. George’s proposed boundaries, which comes out to 12,996 verifiable signatures. Of the 17,102 signatures submitted, Raborn’s office accepted and certified 14,585. The other 2,517 were either rejected or stricken from the petition, Raborn said. St. George supporters hailed the announcement as a significant victory for their movement. The Registrar’s Office began counting signatures in late January, nearly three months after St. George organizers submitted their petition to the office. The St. George incorporation effort quietly resurfaced last year, with opposition from the mayor’s office, Baton Rouge Area Chamber and other groups ramping up in recent months. M.E. Cormier, executive director of Better Together—which is among those opposed to the incorporation effort—says at this point her group hopes the election is held in October when voter turnout is typically the highest. It’s important to get as many voters as possible to weigh in on the “historic request,” she says. In a prepared statement, BRAC says its anti-St. George position remains unchanged. In a statement issued around 3:30 p.m., Mayor Sharon Weston Broome echoed the sentiments of both groups, encouraging parish residents to closely evaluate the St. George proposal and the services it claims it will provide. Raborn has forwarded the petition certification to the governor’s office, which will determine whether the petition meets the qualifications to call an election. While there’s no clear-cut timeline, Murrell says the item could go before voters as soon as May, or as late as November, depending on how quickly the governor’s verification process goes. Editor’s Note: This story has been updated to include recent comments from the mayor’s office.